WIAW~True Confessions and a Recipe! I have been among the missing for a bit and I do apologize for it. No real explanation except life gets in the way sometimes. But I wanted to get back for What I Ate Wednesday because I missed playing along with Jenn and all of the fun kids over at Peas & Crayons. So Here Goes! Well, it is the week of St. Patrick’s Day so I’m using this logo. Since I wasn’t around to say it…Happy St. Patrick’s Day! First the true confessions part. I have been off track with my eating and I would be truly ashamed to show some of the things that I’ve wolfed down in recent weeks. No one’s fault but my own. However, I always have a safety net, a trick in my back pocket that works wonders for me. 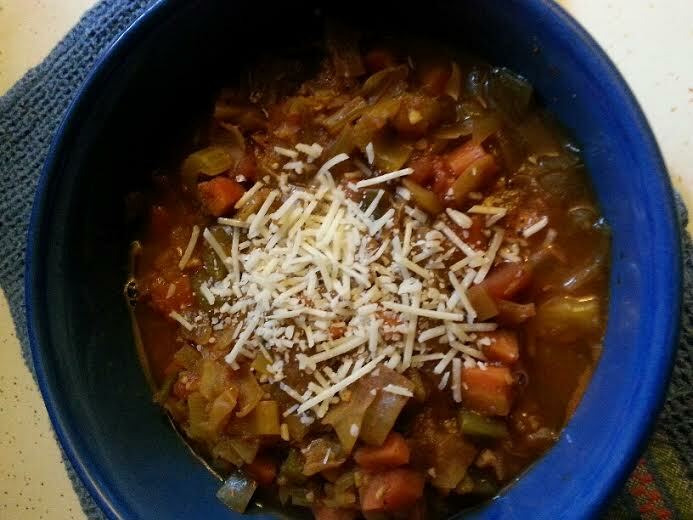 Weight Watchers vegetable soup. With all the updates to the program, I’m not even sure what the current “Garden Vegetable Soup” recipe looks like. Over these many years (almost 27 years) of being a Weight Watchers member, I’ve made some changes and made it my own. This is my current version. I have for a number of years made my veggie soup in a crock pot. I like it because I can make it and then it takes care of itself. All of these veggies can be adjusted as to amounts depending your preferences. I sometimes add others depending on what’s in the fridge, but this is the basic. That’s one of the best parts of this soup, you can make it your own as I have. When it comes to spices, I vary that again depending on my whim. Right now my spices are cumin (liberally sprinkled), turmeric (good for me for anti-inflammatory purposes, so I’m told, also liberally sprinkled), a dash of cayenne or several, depending. I also like to add a few teaspoons of Worcestershire sauce. I cook in the crock pot for usually about 4-6 hours on High. You can cook as long as you like depending on how crunchy you like your soup. I like mine still a little crunchy. This soup as it is counts for 0 Points on Weight Watchers. For anyone who is following Weight Watchers and want to make this, I have a suggestion. If you want to add something else to it, pasta, rice, quinoa, beans or meat if you are a meat eater, I suggest that you make the basic soup. Then take out the portion you want to eat. After you’ve done that, then measure and add whatever else you want to add in. That way your big pot of soup stays “pure,” it still counts as 0 Points. You can then calculate the Points for whatever you might be adding to your portion of soup. Just makes life simpler and you’re left with a pot of 0 Point soup in case you have a day when you’re Hungry and need something that counts for 0 Points. It is so delicious and so versatile. It’s a great tool for helping me stay on track. Even if you’re Not a Weight Watchers member, it can be a help. That’s it for me today for WIAW. Be sure to join in all of the fun over at Peas & Crayons. Have a great day! 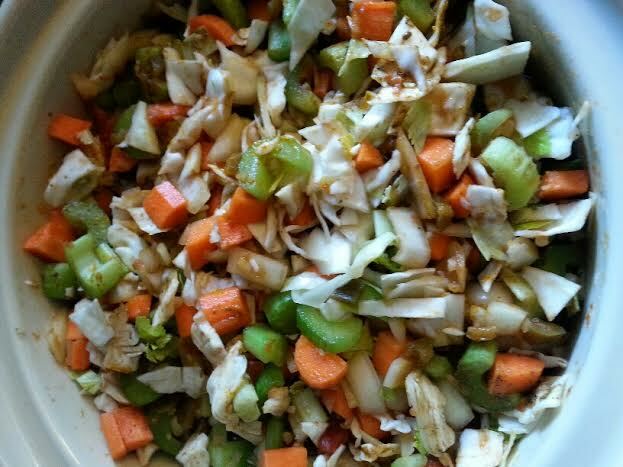 This entry was posted in Uncategorized and tagged crock pot, recipe, veggies, Weight Watchers, WIAW. Bookmark the permalink. Yum! That soup looks fantastic! It is delicious and it’s very versatile. You can use it as a base for so many other versions. Thanks for visiting! MMhmm! I love veggies and I love soup, looks like a match made in heaven! Hi and thanks for visiting! I love veggies too and soups are my favorite. This is really a good basic soup that you can work with. Please stop by again! What a great idea! I love the idea of making the base and then adding to it. I SO want to make this. Thanks for sharing! Thanks, it’s a good tool for staying on track. Thanks for visiting my blog! This look fantastic! I love a good soup – extra garlic for me! Thanks, Laura! Extra garlic for me too, but I don’t like to scare other people away. Have a great day! !